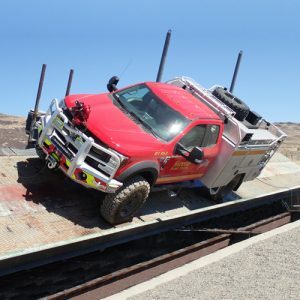 Based on our years of experience with on- and off-highway vehicle testing, we at NATC have developed facilities to provide efficient and effective vehicle evaluations. Our location provides terrain types found throughout the world. Terrain analogs have been established within the contiguous test boundaries of NATC for representative areas in the Middle East, Far East, Europe, North and South America, and Australia. The amount and variation of terrain is extensive, and virtually any required terrain configuration can be simulated naturally. Test course conditions are controlled to provide year-round consistent and repeatable input. At our main proving ground in Nevada, we have facilities to support testing, including customer work spaces, vehicle and equipment storage, a fabrication shop, workshops, a wash bay, fuel pumps, an instrumentation shop, vehicle payload, and test facilities and courses. Additionally, we provide virtual design and test of components and vehicle systems, including CAD, FEA, and multi-body dynamics simulation. Within a 60-mile radius of our main proving ground are major interstate highways, state highways, cross-country trails, deserts, and the peaks of the Sierra Nevada mountain range. Sahara, sub-Sahara, Alpine, River Delta, Tundra, Coral, and Savannah test areas are found in this region. We have easy access to Death Valley, 14,000-foot Mt. Whitney, Pacific Ocean beaches, and wilderness areas of northern California, northern Nevada, southern Idaho, and southeastern Oregon. Local elevations range from 3,900 to 11,000 feet on the western slope of the Sierra Nevada mountain range, and local temperature extremes can average a 70 °F differential from desert test areas to mountain test areas. Within one 24-hour period, 50 °F temperature differentials can provide stable test conditions at low and high levels for thermal response studies. These terrain and temperature extremes allow testing under conditions similar to those in many parts of the world as formidable obstacles to wheeled and tracked vehicles. We utilize the West Yellowstone Airport Facility located in southern Montana as our primary winter test site, which includes shops, offices, and storage needed for support of testing. This site is available November 15 through April 15 each year, and approximately two million square feet of groomed test surfaces for evaluating tire traction and vehicle performance.